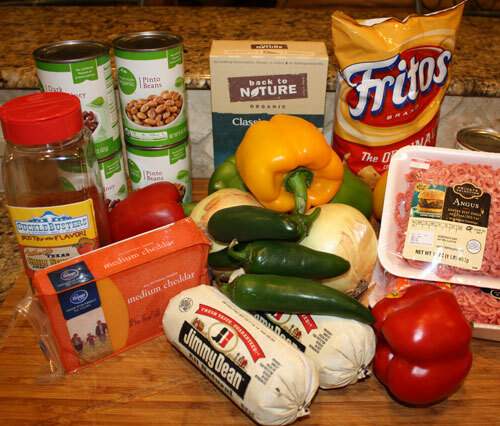 The BEST Chili recipe in Texas - 2 time winner of Chili Pepper Magazine's Awards! The Best Chili in Texas! We have been making this chili recipe for over 30 years and it is a winner everytime! 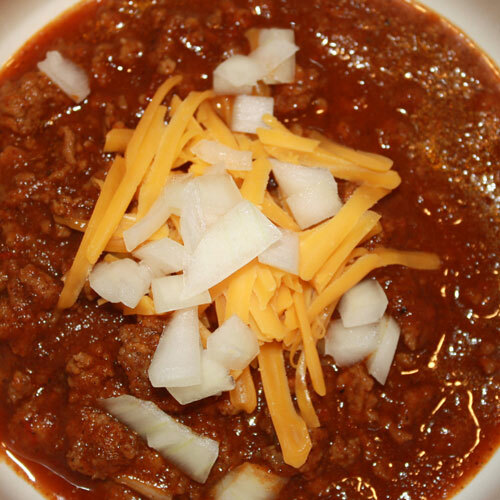 This recipe is included on all of our chili seasoning products. Beans vs No Beans: This recipe will work either way. For chili with beans, add 1 can of pinto plus 1 can of kidney beans just before serving. The idea is just to warm the beans in the chili just before serving. A benefit of adding bean is the stock, which adds a great flavor to the chili. For those who prefer no beans in thier chili - consider adding the bean stock only. What is chili meat? In Texas, when we say "Chili Meat" we mean the large-grind ground beef, pictured here in the middle of the plate below. 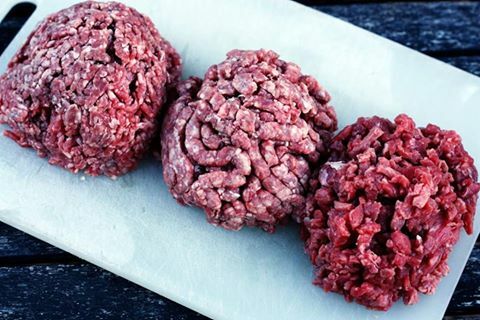 To the left is regular ground beef and the one on the right is finely cubed beef. Any of these sizes will work in this recipe, however we prefer "chili meat". 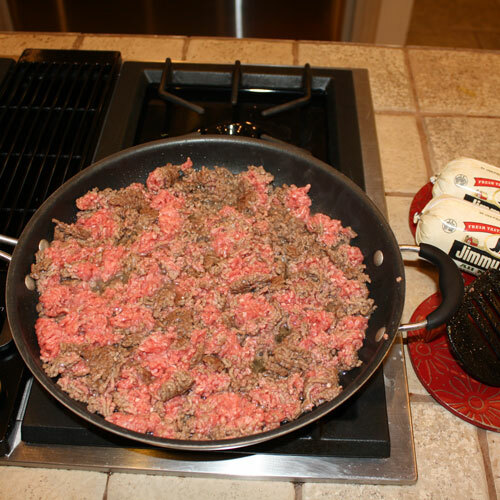 Also, with this recipe, you can choose any type of meat; beef, pork, venison or ground turkey. 1. Brown the chili meat and sausage in a large skillet. Drain and discard the excess drippings. Add the browned meat to a large dutch oven or 6 quart cooking pot. 2. Finely chop the onion and bell peppers, add to the ducth oven. 3. Add 1 cup beef broth. 4. Add 1 can tomato soup. 5. Add 6 TBSP Sucklebusters Chili Seasoning. 6. Stir until all ingredients are combined. 7. Bring to a low boil, cover, then reduce temperature to a simmer. 8. Simmer for 1 hour, stiring often. Remove from heat, serve in bowls top with chopped onions and shredded cheese. This recipe won 1st place in Chile Pepper Magazine Awards in 2013 & 2014. Enjoy! - Add 1 or more finely diced jalapeno peppers for an extra kick of flavor and heat. - Add 1 heaping tablespoon of prepared mustard for additional flavor. 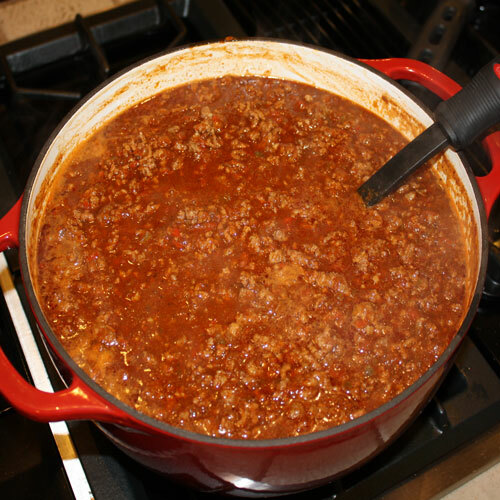 - The longer this chili cooks the better it tastes, so allow it to simmer for up to several hours, adding additional water as needed. - Use a food processor to chop the onion and bell peppers into a super fine dice. - Add SuckleBusters Pepper Sauce to kick it up a notch before serving.